Fundraising Thermometer: As of May 22, 212 generous donors (individual, group, corporate) from our community have raised $100,005! Help us colour in this original artwork with your donations toward our campaign goal of $100,000! All donors are invited to colour in the artwork in person at Upbeat Artworks. All donations over $20 receive a Charitable Tax Receipt. 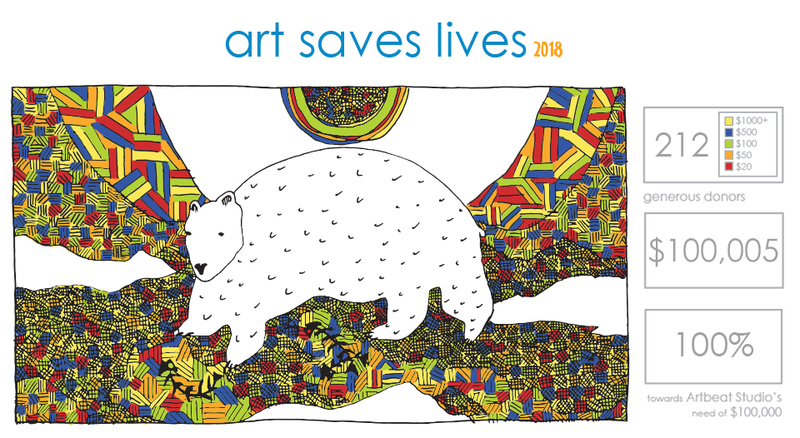 Thanks to all generous donors of Art Saves Lives 2018! Visual Courage, the 26th Biannual Exhibition, January 2018. Over 230 artists have participated in Artbeat Studio’s Artist-in-residency program. 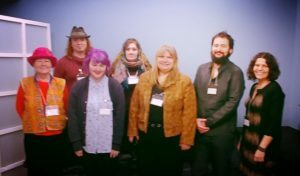 Thank you to all the generous donors who poured support into Artbeat Studio last year, ensuring our unique community based, peer directed mental health and arts programming for 2017. We remain inspired and grateful for such tremendous community support. With the Art Saves Lives 2018 fundraising campaign, we ask for your financial support — donate today to keep Artbeat Studio alive! I know that Artbeat saves lives, because it saved mine. Mental illness has a substantial impact on the individual, family, and community. It affects people in all occupations, educational and income levels, and cultures. The debilitating effects of mental illness can affect a person’s relationships, employment, and overall well-being. Barriers and risks experienced by our participants who live with serious mental illness are many and include stigma, discrimination, poverty, addictions, homelessness and suicide. Artbeat Studio is truly unique- there are no similar programs in Canada. Artbeat Studio is in its 13th year of operation and currently runs three major projects that benefit participating artists. The core artist-in-residency program has mentored over 230 artists. Studio Central, Urban Arts Centre is in its 6th year of operation and offers free-of-charge daily art programming, performances, and outreach programs which all contribute to a more vibrant and healthy community serving over 600 individuals each month. Gallery-boutique Upbeat Artworks is a social enterprise open to the public — promoting mental health awareness through the stories and art of Artbeat Studio Alumni. The ongoing and growing demand for Artbeat Studio’s programming attests to the real need for peer-directed, community based mental health arts programming. Every donation counts. Support healing and empowerment by donating today! ***Original artwork by Callen Froese.